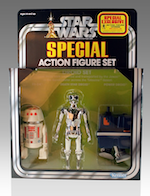 Your eyes do NOT deceive you, True Believer. 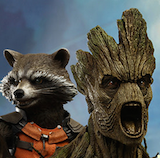 She’s real, and she’s making landfall in the Marvel Universe this November! Introducing…GWENPOOL! Making her thunderous debut in November’s HOWARD THE DUCK #1 – meet the character that’s already taking the world by storm! She’s smart, she’s charming, and she can shoot and stab her way through a gaggle of Hydra goons before you know it! 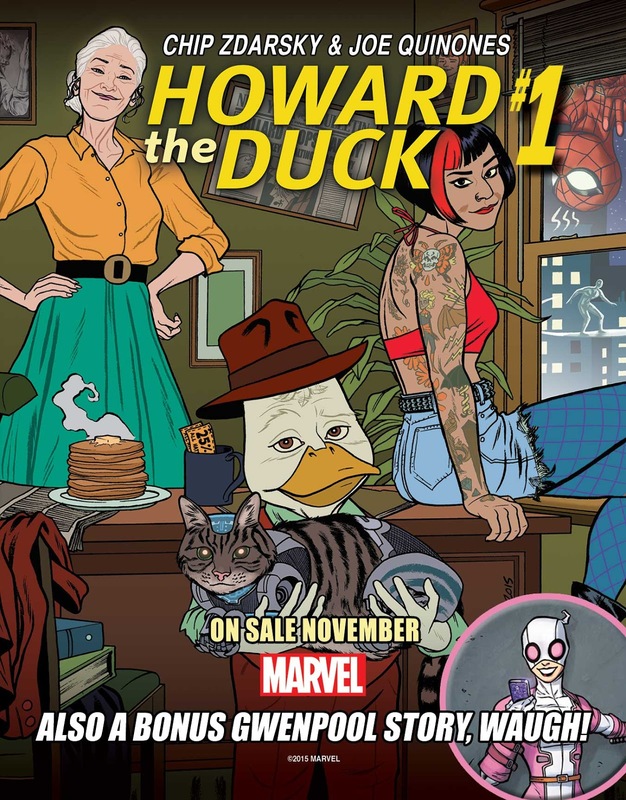 And she’s coming to our universe for special backup stories in HOWARD THE DUCK #1 - #3 – written by Christopher Hastings with art by Marvel newcomer Danilo Beyruth! A stranger in a strange land, she’ll enlist the aid of someone who knows a thing or two about being from an alternate universe – Howard the Duck! 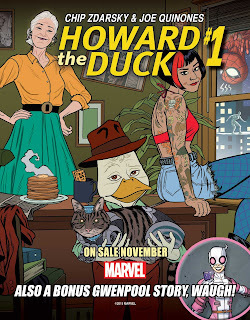 Now birds of a feather, the Marvelous Mallard is about to show Gwenpool the ins and outs of her new home – the All-New, All-Different Marvel Universe! 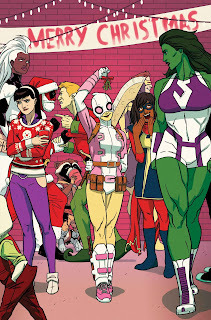 Then, tis the season in December’s GWENPOOL SPECIAL #1 – as the biggest creators and biggest heroes from across the Marvel Universe band together for holiday cheer! 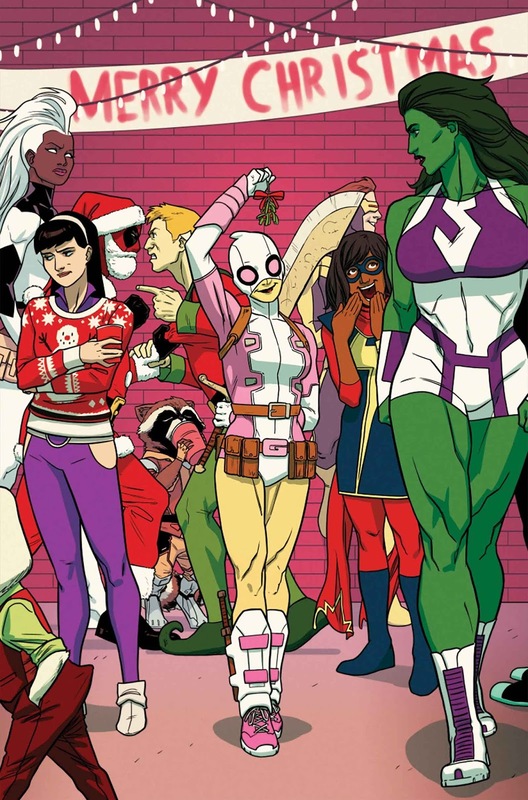 She-Hulk throws a party and invites the entire Marvel U! Deadpool and both Hawkeyes – Kate & Clint – team up to take down a holiday pickpocket! Ms. Marvel battles her most dangerous threat yet: the holiday blues! And of course, the woman of the hour, Gwenpool herself! 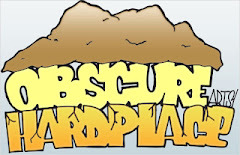 Featuring Gerry Duggan, Charles Soule, Christopher Hastings, Danilo Beyruth, Langdon Foss, Gurihiru and more – this is one you won’t want to miss! She’s here, and she’s ready to slice and dice her way into your heart – literally. Don’t miss her exciting debut and origin in the HOWARD THE DUCK #1 - #3 beginning this November and pick up GWENPOOL SPECIAL #1 this December!